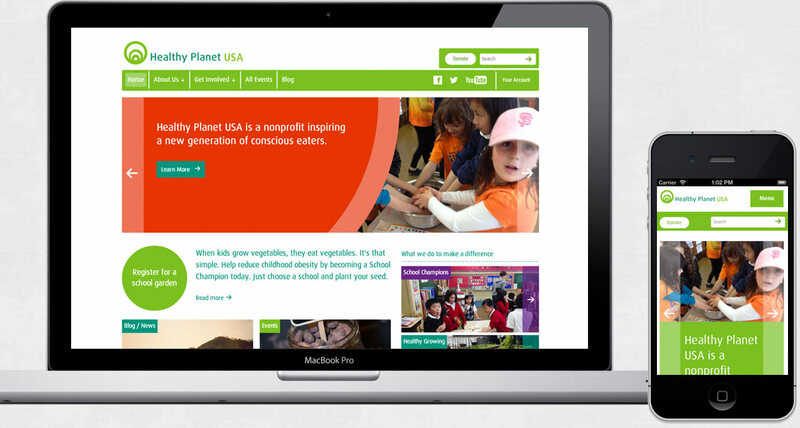 Last summer I was approached about developing the US version of Healthy Planet, a UK non-profit aimed at helping kids live healthier lives. Today I’m happy to announce that the site has been completed and is now up and running, ready for parents, teachers and the rest of the world to gain a ton of invaluable knowledge from. This is one of the most enjoyable sites I’ve built in a long time. The design was based off of the original UK site, but the development was 100% original code. With WordPress as the backend, I created a responsive site that made perusing the site a joy from both desktop and mobile platforms. Not-so-run-of-the-mill components include recurring and one-time donations powered by Stripe, including account management that gives users the ability to create, cancel and otherwise manage how they donate to the organization. BBPress is up and running on the site, along with Events Calendar Pro, and a host of custom post types developed to allow administrators to showcase healthy ingredients and recipes. Another component is a basic crowdfunding application built with Stripe and custom post types in WordPress that allows the organization to facilitate schools looking to create a garden where students can learn more about growing their own food, and a more natural approach to eating and being healthy in general. There’s even a feature where you can customize the type of news content you receive based on your preferences. The folks behind Healthy Planet USA are some of the nicest I’ve ever worked with, too, and I can’t recommend giving the site a look through enough. Fantastic site and a total pleasure working with you. You met all our requirements and then some. Your work is first rate and highly recommend you. You pulled this off when other top developers weren’t sure it could be done as specified.